SMARTePLANS® are just not the same as “regular” floor plans. We wouldn’t have two patents if they were. The best way to explain it to you is probably to SHOW you a real-life example. Below is the same house. 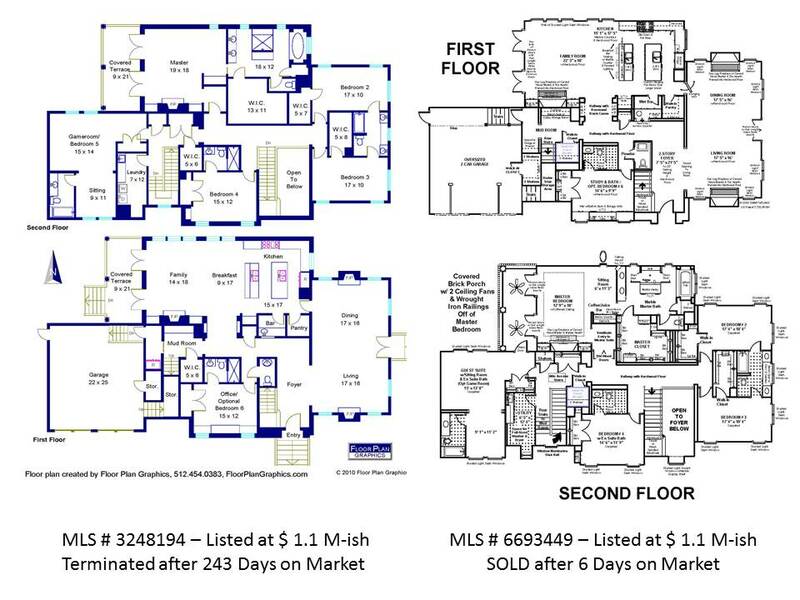 A carefully crafted custom-created floor plan was uploaded onto MLS to market the home. In this particular case, the outcome was not favorable. The home didn’t sell, and after 243 Days on Market the listing agreement was terminated. A new real estate agent obtained the listing and we sold it in 6 days! SMARTePLANS was hired to produce our marketing materials that include the pictographic and annotated floor plan with 14 photos embedded inside of it that launch at a click of the mouse. The actual SMARTePLAN showed the whole corner lot in Bellaire (because we show the WHOLE property) and you can click the PDF below to see it. For the purpose of a one-to-one comparison I endeavored to make both products the same size and show them side by side. But even at the flying-at-30,000-ft-view, you can see the two products are quite different—- and at the very least … don’t you think a prospective buyer would want to KNOW there are two dishwashers in the Kitchen? Patented format contains detailed pictographs, captioning and descriptive annotations never before added to “floor plans”, but included in our patents. Depicts the WHOLE property, not just the structure … decks, landscaping grounds, gardens, pools, ponds, porches, loggias and outside space are all depicted in the drawing. Combines and integrates three different types of data/information into a single portable and self-contained file (Floor Plan Drawing + Embedded Photos + Descriptive Text) creating a fully functional mini-brochure that can be emailed, posted on websites and distributed via social media (Facebook, LinkedIn and Twitter… to name a few). Displays the property in an engaging and interactive manner. The easy-to-read pictographs transcend language barriers, international borders and time zones. Capable of being uploaded as an active file onto MLS (not a non-interactive jpg photo); yet is also independent of MLS and can be distributed across the internet via multiple venues. Capable of being indexed to search engines for optimum distribution and exposure. Capable of having a furniture-moving module added (which also has the same distribution capabilities including uploading onto MLS). 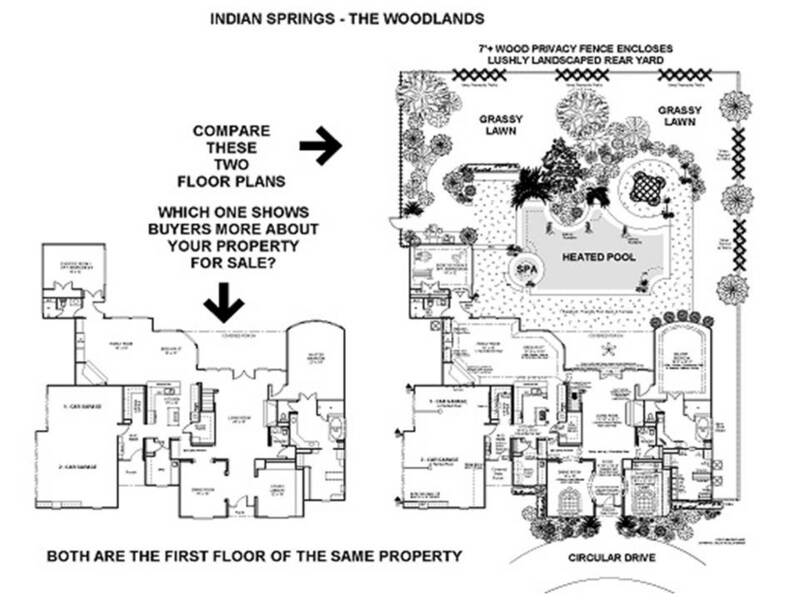 Floor plan drawings are custom created and protected by copyright. Existing drawings can be retrieved from archive storage, updated and used to market the property again when it comes back onto the market —- next month or 5 years later. If you were selling this home, which one do you think does a better job of marketing the property? Which one do you want to use to sell YOUR home?